‘Mycelium’ is a network of interwoven, thread-like hyphae that constitute the vegetative part of mushrooms. 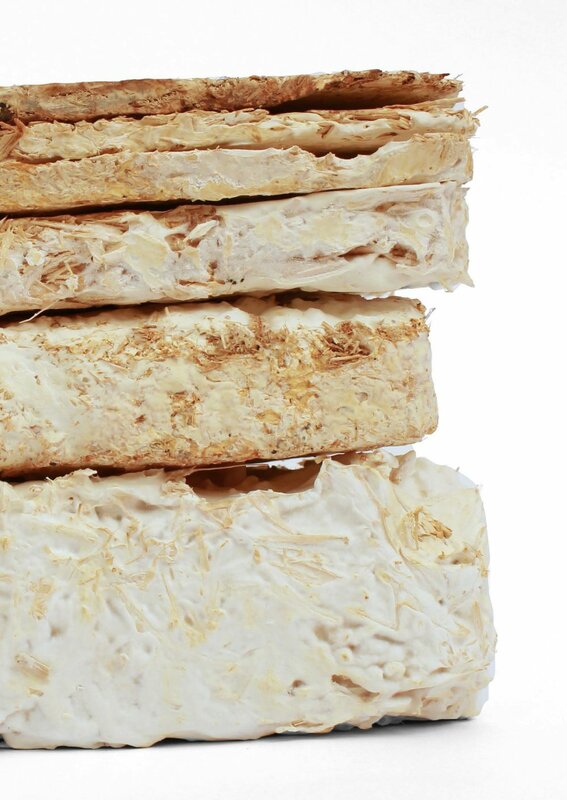 In this project I explored the potential of mycelium-based materials for product design. I applied the Material Driven Design Method to guide the design process. Unlike conventional materials, this material grows and therefore has a different development process. The material is produced by adding fungal mycelium to an organic substrate (e.g. sawdust or straw), in biological terms also called inoculation. When combined, the mycelium obtains the nutrients from the substrate to grow and through this process it binds all the loose particles together, creating a composite material. In tinkering with the material, I realised that the ultimate material qualities (technical and experiential) depends on material ingredients, the growing condition and final processions. By varying these three main aspects in controlled experiments, I could achieve a number of material concepts, which had seemingly different qualities. Reflecting on the material purpose, I realised that the grow-ability of the material into any shape is a very unique opportunity. Furthermore, in experiential studies, I saw that material invited people to scratch, as it crumbled easily. This performative quality of the material (Giaccardi and Karana, 2015) inspired the final product idea. It is a new packaging for (wine) bottles providing a new way interacting with packaging. 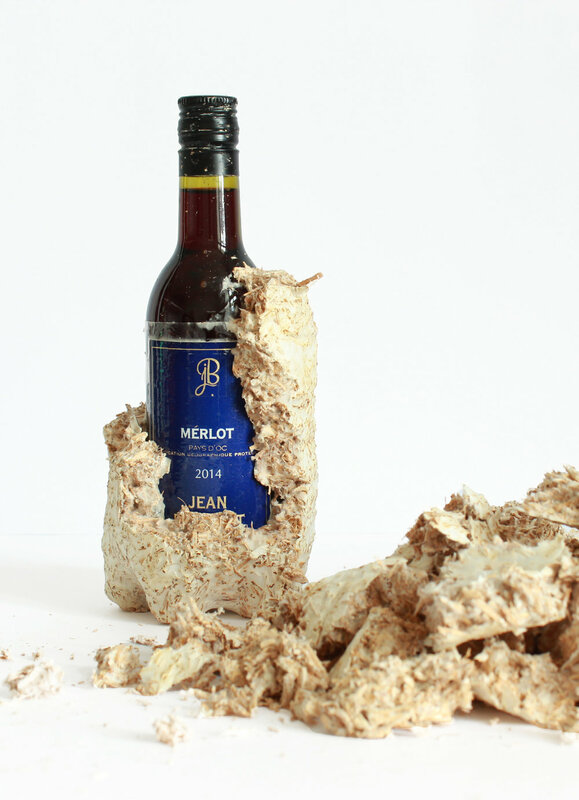 In this product mycelium material is grown directly around a (wine) bottle. Due to the shaping qualities of the material it protects the object as a ‘second skin’ during, for example, transport. 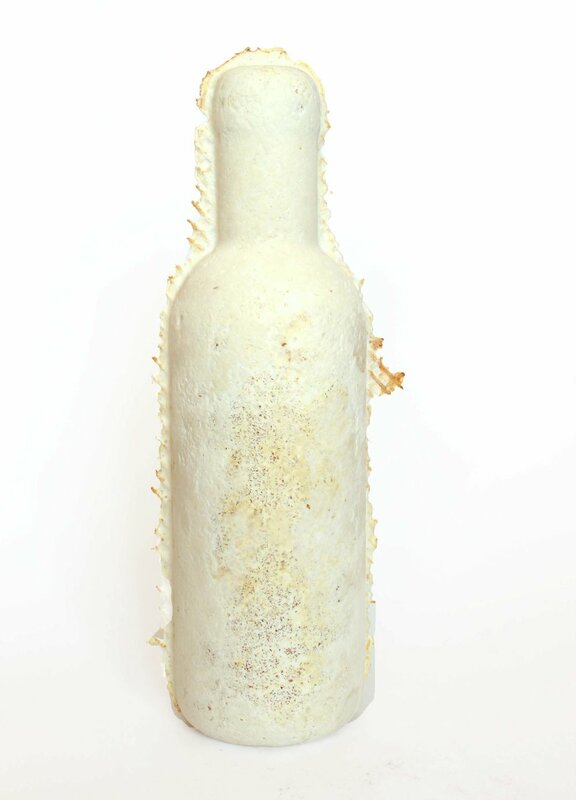 By peeling of the skin, the bottle is revealed. The interaction with the product highlights the naturalness of the material and encourages throwing away the second skin in nature. The uniqueness of the product is the performative quality when “unpacking” the bottle, and adds an extra dimension to the experience of the product.